Two Mount Pleasant High School seniors, David Barboza, and Jose Liera have been named National Hispanic Scholars. 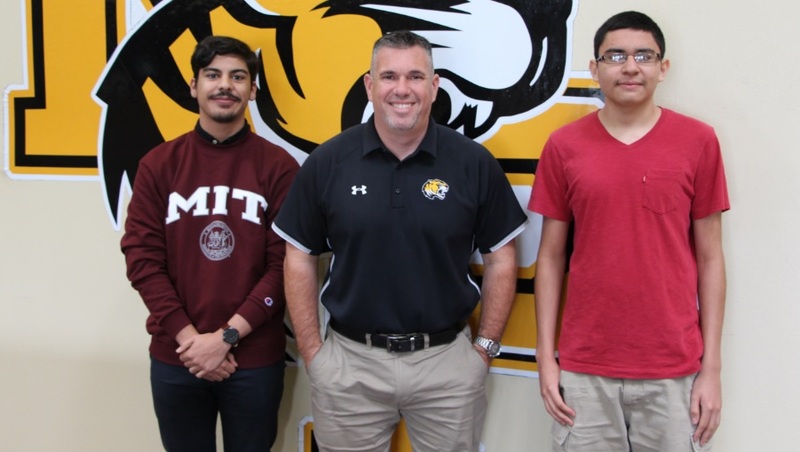 In order to be considered, students had to score in the top 2.5% among Hispanic and Latino PSAT/NMSQT test-takers and have a qualifying GPA of a 3.5 or higher. Barboza is the son of Rosa Rojas and Juan Barboza. He is interested in attending either the Massachusetts Institute of Technology (MIT) or Columbia University. Liera is the son of Victor and Paula Liera. He is interested in attending the Massachusetts Institute of Technology (MIT), Stanford, or Harvey Mudd College. Fifth Grade: Brissa Alvarez, Alberto Avila, William Baker, Joshua Bello, Valerie Cassio, Alyse Cervantes, Julian Chancellor, Judson Colley, Carter Cook, Ernest DeLaRosa Cardona, Aaliyah DeLaRosa, Lyric Doddy, Abigail Espino, Javan Garcia, Mariana Hernandez, Tyland Jones, Trixz Kimball, Celeste Landin, Mollie Luck, Valerie Moss, Claire Muskrat, Jaqueline Pena, Chelsea Plascencia-Mendoza, Ailin Quinonez, Leinad Rodriguez Aguilar, Alondra Ruiz Lara, Alondra Santos, Andrew Simmons, Chloe Simmons, Matthew St. John, Kortland Stovall, Abraham Tolentino, Kevin Urbina, Bennett Wall, Makenna Webb, Nathan Zavala. Sixth Grade: Rachel Albin, Jorge Almazan Jr., Luis Alvarado, Ashlin Arrington, Natalia Aspeitia, Katherine Ball, Jeffrey Bond, Jasmine Briones, Elizabeth Buck, Camila Campos, Tiyanna Canton, Haley Carr, Kris Castaneda, Samuel Chappell, Selena Clark, Diya Desai, Danna Escobar, Aziyah Farrier, Anna Fuentes, Donavyn Gafford, Nikolas Garrett, Gabriella Garza, Aylyn Gerardo Garcia, Jose Gonzalez, Patricia Gonzalez, Stephanie Guerrero, Addison Heeren, Hayden Hester, Skyler Hopkins, Heissel Jaimes, William Johnson, Kinley Lowry, Dori Macedo, Tanner Marshall, Amir Martinez, Eunice Mendoza Garcia, Rane Miller, Jesus Moreno, Karlee Moya, Andrew Murray, Alivia Newman, McKaylie Nixon, Dollian Phan, Alayza Police, Carlos Reyes, Hesley Rocha, Francisco Rodriguez Jr., Christian Sanchez, Alexander Sandate, Chloe Snodgrass, Christopher Sorto, Katelyn Tejeda, Hayden Tennison, Katherine Thompson, Luke Thurman, Diego Torres, Johnathan Ventura, Arturo Yanez Jr.